This statistic shows the average monthly reach of the leading national newspapers in the United Kingdom (UK) from January 2018 to December 2018. 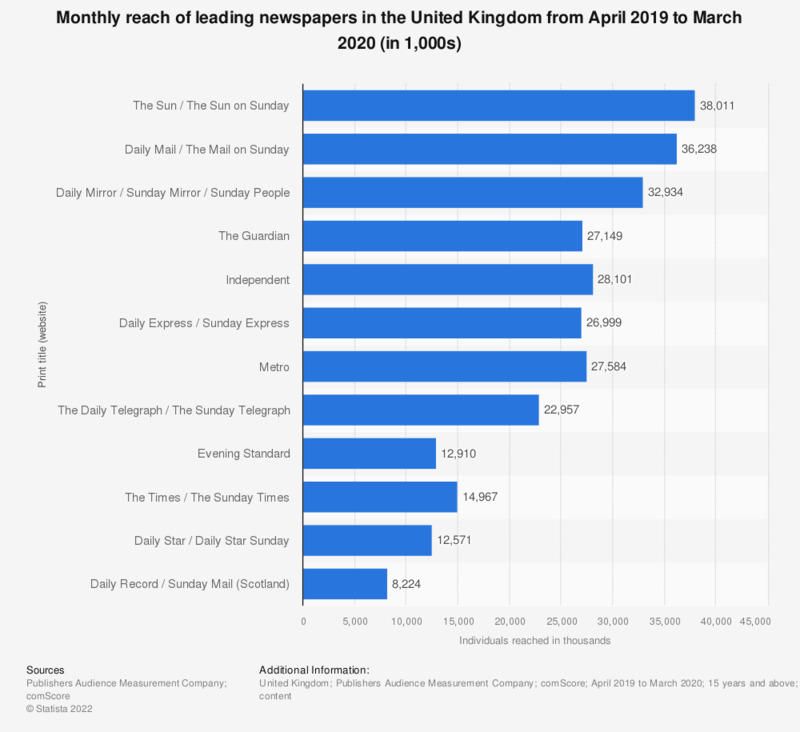 The print title of tabloid newspaper The Sun (including The Sun on Sunday) and its associated websites had the highest reach with an average of approximately 29.3 million individuals reached per month through both its print and digital formats. Mid-market newspaper Daily Mail (including the The Mail on Sunday) and quality title The Guardian (including the The Observer) had the second and third highest monthly combined print and website reach among British national newsbrands in the period of consideration, with around 29 million and 25 million individuals reached on average, respectively. * The source adds the following information: "Total Brand Reach (TBR) is a measure of the reach of all print and digital related content for each publisher brand." Where a single title had multiple websites, only the highest reaching title(s) were included here. See the source for the web addresses of each title.